Make your crowdfunding campaign a success before it hits the ‘net with the ten best resources for crowdfunding pre-launch strategies. You’re excited, you’ve got an idea for a new product and you want to raise money crowdfunding. After-all, if a guy can raise $55,000 on Kickstarter to make a bowl of potato salad then your idea should go viral, right? Then nothing. Literally, crickets aren’t even chirping. It’s because you missed one of the most crucial steps in the process, crowdfunding pre-launch. Pre-launching your crowd campaign is about building that momentum so you hit the ground running on day one. It’s about building a community that will promote your Kickstarter out to the rest of the crowd. It’s how I’ve been successful in all my campaigns and how people I’ve helped have raised more than $230,000 in support. And I’m going to share some of the most critical steps of the crowdfunding pre-launch process in the article below. 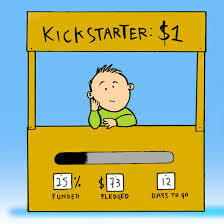 This post is a follow-up to Monday’s article on pre-launch crowdfunding steps. Check it out for an checklist review of the three main steps in crowdfunding pre-launch: research, outreach and community building. At over five pages long, it is a great list and brings some unique tips to your campaign. I’ve tried to get all the key points but click through the links and scan the posts for anything I’ve missed. Despite the fact that 60% of crowdfunding campaigns fail to reach their funding goal, raising money through the crowd can actually be a pretty easy task. If you’re ready to beat your crowdfunding goal, I mean really ready to raise as much money as possible for your project, check out the complete crowdfunding guide – Step-by-Step Crowdfunding. Beyond pre-launching your campaign, this guide includes steps in creating a campaign that will draw the crowd and how to put it on auto-pilot to save you time. The book is laid out in 17 steps you must take for a successful campaign, from putting the idea together to leveraging your fundraising success to raise even more money in future campaigns. 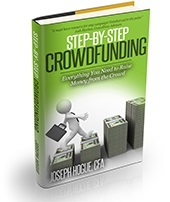 Get your copy of Step-by-Step Crowdfunding and get started today! Ian and Levi of Launch and Release offer a review and critique of Indiegogo’s crowdfunding pre-launch videos and some great tips of their own. The site is targeted to music crowdfunding so a must-read for any musicians thinking about crowdfunding their next album. Know your Fans, Friends and Family for pre-launch crowdfunding. Too many crowdfunders think the game is about quantity and the need to get the message out to thousands to be successful.The average successful project on Kickstarter has about 70 funders. That’s not a huge hurdle for your crowdfunding pre-launch but you do have to reach the right people. Focus on your established network that is already willing and ready to support your project. Research other campaigns and set realistic crowdfunding goals. This is something we talk a lot about on the Crowd101 blog as well. Researching other campaigns is going to help you put together a crowd project with a better chance of success. Don’t be afraid to price your rewards like a fundraiser but be realistic on your overall funding goal. Researching Failed and Successful Projects – I love this idea and haven’t seen it in many other lists. Even if yours is a one-of-a-kind tech gadget, you can still look to other technology crowdfunding campaigns to see what works. Get in touch with a few of the failed campaigns to see what they did wrong. Establishing an Online Presence – Assuming that the 13 million monthly visitors on Kickstarter will just happen by your campaign is a big mistake. You need to draw people to your crowdfunding campaign and unless you get featured on the crowdfunding platform’s homepage, you need to do it with a strong online presence. Build a Website and a blog – It’s incredibly easy and very cheap to put together a small website with a blog. A blog is just a page on your website that you post articles to on a regular basis. These regular articles are key to building community with people that care about your cause or business and will help you get found when people search the internet. I would recommend you write something and post it to your blog at least once per week. Set up Social Media profiles – At minimum, you need social media profiles on Facebook and Twitter. I would also add LinkedIn if your product is targeted to businesses. You don’t have to be active on all of these everyday but try to check in once or twice a week to ask and answer questions. You will also want to post the articles from your blog. It will take time but you should have a good network by the end of three months. Setting a Budget and Funding Target – I have covered budgeting and setting realistic crowdfunding goals in detail and there isn’t much new here. Understand that your budget and funding target may be different. Even if your budget is $100,000 for the first year, it is unlikely that you’ll be able to raise this much money crowdfunding. Set a realistic crowdfunding target and use later campaigns for other budget needs. Building Marketing Collateral – Your campaign page must have a video and you should be in it. Campaigns with videos have a better than 60% chance at meeting their funding goal whereas those without have less than a 35% chance. You don’t have to describe your project in detail, just put together a professional-looking two- or three-minute video that hits on key emotional points. Focus on what your cause or business does for others! Unless it’s your close family or friends, people are not backing the project for you. They want to know how it will benefit them or a group they care about. You should post your budget, in as much detail as possible, in a separate handout or spreadsheet. Putting together a detailed budget helps people see that you are serious about the project and have dedicated the time to think it through. Put together a flyer and a brochure that people can print off and use. Actively ask people to print your materials or email them to others. You can use all these marketing resources in the future so the upfront cost will be spread out. Maria Winnie of Community Funded posts an email template and outline for team outreach in the day leading up to the campaign. We spend so much time talking about what to do over the months leading up to a campaign that a lot of people forget how important that last day is to really sealing the deal with your community. Maria suggests sending out team message about 24 to 36 hours before the campaign goes live. This is important because it gives your team enough time to contact their networks and get everyone ready for the launch. This is really where you want to build that sense of urgency into your messages. All your crowdfunding pre-launch excitement should be building up to this. If you can get people sitting by their computers as if it were a Cyber Monday flash sale, you’re off to a great pre-launch crowdfunding start. Don’t leave any of your crowdfunding pre-launch emails to assumptions. List out exactly what you expect of everyone; who to contact and how to share. Use bullet points whenever possible for a list or instructions. People won’t read a long email message but they will scan the bullet points to get the message. Crowdcrux posts 6 tools to generate a buzz before you launch a crowdfunding project and a list of six websites that can help to bring people to your campaign. It lets you create a profile to gain support from others on the platform. If your profile gains enough support before a deadline then the site posts your campaign to social media sites like Facebook and Twitter. I like the idea but am not sure an all-or-nothing type of marketing tool is helpful to many. PitchFuse lets you post your campaign idea and get feedback from the community. The site does not have a ton of traffic but is a good resource for connecting with other crowdfunding campaigns to get feedback. CrowdfundingPR offers free press releases as well as paid advertising for crowdfunding campaigns. The site has good traffic and may be an effective tool but you might want to wait for your campaign launch to do the press release. WordPress is not necessarily a crowdfunding tool but is where you will go to set up your website and blog. I use WordPress for both my blogs and it is extremely easy to set up and get things moving. Nesta offers crowdfunding pre-launch tips and one of the most well-known crowdfunding success stories that demonstrate the effectiveness of pre-launch community building. When author Seth Godin crowdfunding his book project, he used his huge internet fanbase to meet his crowdfunding target of $100,000 in just three hours. Less than 3% of crowdfunding campaigns raise more than $100,000 and he did it in three hours! Building community around your crowdfunding campaign means getting people involved and making them feel a part of the project. Throughout your pre-launch activities, involve others in the idea generation and design of the campaign. Give people a vested interest, through their time spent helping, and a reason to make the campaign a success. Entrepreneur.com suggests you do these six things before launching your crowdfunding campaign. The advice is built around the successful campaign of Nathan Resnick that raised $15,000 in three days for Yes Man Watches. Through a friend on Facebook, the company was able to get an interview on the biggest watch blog in the world. Within a day of the interview, the company’s social media pages blew up with almost 800 likes in a week. You really need to reach out to every possible contact and use existing social networks. It’s said that everyone on earth is connected to everyone else by six people or less. Use your network to increase your online exposure. Film-maker Nathaniel Hansen offers up a very detailed post on 7 things to consider before you launch your Kickstarter project. Story – I like the use of the word Story here because you really need to draw people in with an emotional and compelling narrative. Running a cause or business is no easy task and you must have a passion to do it. Relate your story in a way that readers catch that passion and want to become part of it. Fans – Put together a list of all your professional, personal, family and friends contacts. Nathaniel recommends you cut your list by the people that you think might be annoyed or put off but I say Call them ALL! You aren’t necessarily asking them for full support (yet) but just asking for input on the idea. If they aren’t willing to give you 15 minutes of their time then reassess whether they should be on the list at all. Evangelists – You’ll also see the term Influencers used online. The idea is that some people have a seemingly natural ability to connect and influence others. These people are crowdfunding gold! They have huge social networks and are active contributors in projects for which they have an interest. Now, you just have to get them interested. Write, Write and Write – I would add Talk, Talk, and Talk to this as well. Crowdfunding is all about building community and a network through communication. You absolutely must be reaching out to five or more people a day and sharing your passion. Blog, Tweet, Facebook and Repeat – This goes back to the communication and earlier tips. Nearly three billion people are online and there’s sure to be more than a few that want to be a part of your story. Check out my 3-part series on how to create a crowdfunding blog and get people to visit it. Know who are the top bloggers, social networkers and media people that talk about your cause or product. These are going to be the most likely to pass your campaign around through an interview or an article. You also need to research at least one or two internet forums about your cause or business. Actively engaging these groups is a great way to find people that are just as passionate about the project as you are.Research – A lot of crowdfunding campaigns do not take the time to understand their market, and pay the price by not reaching their funding goal. Vision Launch offers a three-minute video of how Marissa Lippert of Nourish crowdfunded her food business. Develop a high­-quality presentation – Paying for professional video services is one of the few areas that I recommend spending at least some of your budget. Unless you already have the equipment and some skills in film-making, you’re going to find it very time-consuming and possibly expensive process to do your own video. It is no longer enough to have a video on your crowfunding campaign, it has to be a professional-quality video. My Crowd Rocks shares the value of crowdfunding pre-launch with two steps in the process. Planning – Put your research to work by thinking about what worked and what didn’t for the other campaigns. Don’t be shy, a lot of the previous campaigns will talk openly about their campaign with you. Bryan Vadas, co-founder of iPledg, shares his tips for crowdfunding success through pre-launch marketing. Through talking with crowdfunding project creators that failed to meet their goal, Bryan finds that the lack of pre-launch crowdfunding is almost unanimously the problem. 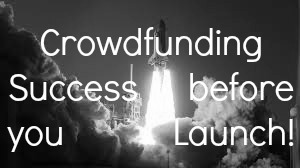 Campaigns that start with no funding at launch have a success rate of just 15% but spend a little time in pre-launch crowdfunding and your odds zoom higher. Crowdfunding campaigns that launch with just 5% of their funding goal already in place have a 50% chance of success. Getting people onboard with your project early is not only about funding but also provides a lot of social proof to other potential backers. The internet is still a very uncertain and untrusted place for a lot of people. Seeing that you already have a lot of people that believe in you and your project will go a long way in establishing trust. 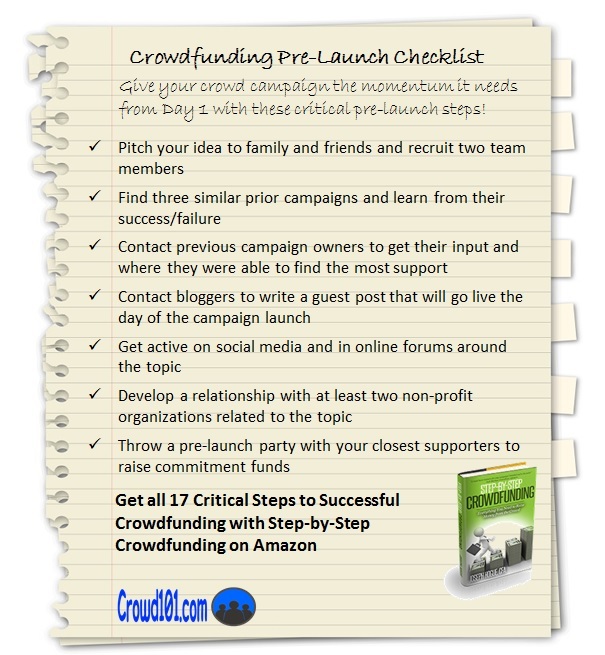 Crowdfundraiser offers 12 ways to prepare and assess your campaign through crowdfunding pre-launch activities. I like that they use the word “assess” as well because pre-launch crowdfunding can be a great tool to find the challenges in your campaign before you put it out there in front of millions. Prepare presentation materials – Don’t stop at a video and brochures. It’s pretty easy to convert your materials into a slideshow presentation. The slideshow can be uploaded to websites like Slideshare.com and attract more people to your campaign. A slideshow presentation is a great way to show the visual side of your cause and reach out on an emotional level. Perfect your pitch – After you’ve engaged your contact list and found a few people that are willing to help out with a little time, talk to them about your campaign and develop a pitch. You should have multiple pitches, shorter ones around 30-seconds and one-minute for quick interactions and longer ones around five-minutes and 20-minutes for longer presentations. Plan your rewards – Rewards planning is one thing I haven’t seen in other posts so it’s good to see it mentioned here. Rewards fulfillment will be a big part of your crowdfunding budget and you need to build in all costs including time and shipping. Stuart McKeown, co-founder of Gleam, details 15 pre-launch growth hacking strategies for startups. While the post is not specifically about pre-launch crowdfunding, it is a very detailed article and applies to crowdfunding as well as starting your own business. Run a Contest – This is a common strategy and can be affective but there is a caveat. You want to offer something that attracts a large audience and is valuable but try to make it something related to your business or cause. Attracting a thousand people that will ultimately have no interest in your crowdfunding campaign may not be worth your time. Build a Free Plugin – Free applications or plugins are a great incentive for people to sign up to your email list or register on your website. There are a few websites that make it fairly easy and you don’t have to be a tech guru. Check out ibuildapp.com for their free service. Make a Pre-Launch Video – As long as you are making a video for your crowdfunding campaign, you might as well make a few. It should not be that much more expensive to make a series of videos than it is to make one. Make one video as the main teaser for your campaign. Make several other videos that address problems or needs served by your cause or business. The great thing about videos is they can be posted to YouTube for even more online presence. Include an Email Signup Link in your Signature – A lot on the list speaks to building an email list for your business. In crowdfunding, your email list is money in the bank. Make it easy for people to follow you by posting a link to your email list signup form everywhere. There are several email list sites on the web but MailChimp and Aweber are the most popular. You can use MailChimp for free up to 2,000 subscribers which is likely all you’ll need. If you’ve read through the entire post and the linked articles, you’re probably as exhausted as I am after having put the list together. Take a couple of seconds to share your favorite pre-launch strategies in the comments below. Any of the strategies above don’t work that well? I want to hear about that too. Ready to start your crowdfunding campaign? Check out the Ultimate List of Crowdfunding and Fundraising Websites. Successful crowdfunding is all about what you do before you even start your campaign. Whether its Kickstarter pre-launching or getting your campaign ready for another platform, you need to build a community around your project before taking it to the digital crowd. It’s only through that initial drive and sense of community that your crowd campaign can go viral and there’s no better way to do that than these tips for crowdfunding pre-launching.